Paul Misut is a licensed environmental engineer with over twenty two years of experience in the field of hydrology. During the past decade he has developed seawater intrusion models, reaction-transport models, and analytical aquifer testing models. Currently, he is delineating well capture zones and evaluating the effect of climate change on barrier-island groundwater. Other projects include the participation in studies related to brine migration in western New York State. He has also taught university courses in groundwater flow modeling and subsurface hydrology. 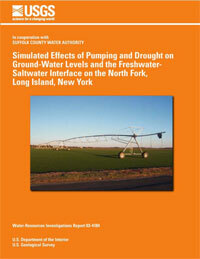 PROJECT TITLE: Estimation of Hydraulic Properties at Well Fields, Suffolk County, N.Y.
BACKGROUND: Suffolk County Water Authority supplies ground water to over 1 million people on Long Island. Improved understanding aquifer hydraulics near wellfields benefits supply management. PROJECT TITLE: Groundwater flow models related to Naval Weapons Industrial Reserve Plant, Bethpage, Nassau County, N.Y.
BACKGROUND: The objective is to develop a steady-state groundwater flow model and calibrate it with available hydraulic gradient data to support the evaluation. USGS will evaluate the capture zones of pumping wells in relation to the VOC plumes in their vicinity. BACKGROUND: Owing to their nature, resources, and location, Mid Atlantic National Seashores have been identified among national parks most at risk from the effects of global climate change. Accelerated sea level rise, more frequent and intense storms, rising temperatures, and changes in patterns of precipitation are all expected to drive significant ecological change.Project objectives include the following: (1) describe baseline conditions and change over time in key attributes of the fresh surface and groundwater resources; (2) develop protocols to assess change; and (3) provide the information needed to develop and implement adaptation and mitigation strategies to reduce the impacts on groundwater-dependent habitats and species. PROJECT TITLE: Evaluation of Manufactured Gas Plants, Suffolk County, N.Y.
BACKGROUND: A massive manufactured gas plant in Bayshore, New York was being remediated with oxygen injection. The local department of health voiced concerns about the saftey of these operations. BACKGROUND: New York City experiences exceptional problems of water supply to its 8 million people, most living on islands. Water is mainly sourced from upstate reservoirs; however, novel approaches to integration with groundwater resources are treated in this project with complex research methods. Methods included application of coupled geochemical/ solute transport modeling to evaluate feasibility of storage and recovery in a previously-unexplored deep aquifer. Deep cores were obtained and subject to mineralogical and and microbiological analysis. PROJECT TITLE: Simulation of saltwater intrusion, Manhasset Neck, Nassau County, N.Y.
BACKGROUND: The Manhasset Neck Peninsula has experienced intrusion of salt water. New modeling techniques were applied to predict future salt water intrusion. Misut, Paul, 2014. 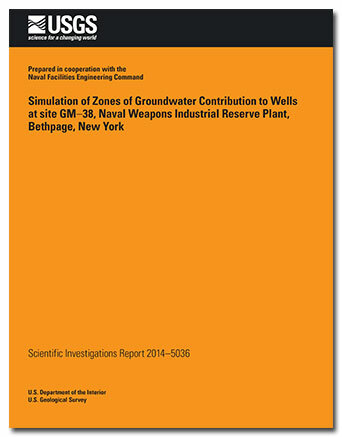 Simulation of zones of contribution to wells at site GM–38, Naval Weapons Industrial Reserve Plant, Bethpage, New York. 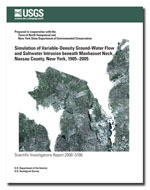 U.S. Geological Survey Scientific Investigations Report 2014-5036, vii, 58 p.
Misut, P.E., and Aphale, O., 2014, Simulation of groundwater pathlines and freshwater/saltwater transition zone movement, Manhasset Neck, Nassau County, New York: U.S. Geological Survey Scientific Investigations Report 2013–5201, 71 p.
Brown, C.J., and Misut, P.E., 2010, Aquifer geochemistry at potential aquifer storage and recovery sites in coastal plain aquifers in the New York City area, USA: Applied Geochemistry, v. 25, p. 1431-1452. Misut, P. E.; McNew-Cartwright, E. R. , 1996. Calibration of a ground-water-flow model by regression. U.S. Geological Survey ; U.S. Geological Survey Earth Science Information Center Open-File Reports Section [distributor], Open-File Report 95-388, iv, 11 p. :ill., maps ;28 cm. Misut, P. E.; Feldman, S. M. , 1996. 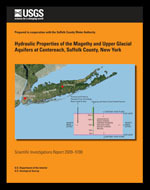 Delineation of areas contributing recharge to wells in central Long Island, New York, by particle tracking. U.S. Geological Survey ; Earth Science Information Center [distributor], Open-File Report 95-703, vi, 47 p. :ill., maps ;28 cm. Detection and Quantification of Oxygenated Polycyclic Aromatic Hydrocarbons (oxy-PAHs) in Groundwater Near the Former Manufactured Gas Plant in Bay Shore, N.Y.
Misut, Paul E.; Busciolano, Ronald J.
Monti, Jack; Misut, Paul E.; Busciolano, Ronald J.
Misut, Paul E.; Schubert, Christopher E.; Bova, Richard G.; Colabufo, Steven R.
Misut, P.E., Schubert, C.E., Bova, R.G., and Colabufo, S.R., 2004 Simulated effects of pumping and drought on ground-water levels and the freshwater-saltwater interface on the north fork of Long Island, New York: U.S. Geological Survey Water-Resources Investigations Report 2003–4184, 58 p., https://pubs.er.usgs.gov/publication/wri034184. 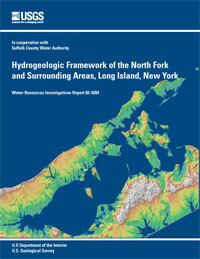 Schubert, Christopher E.; Bova, Richard G.; Misut, Paul E.
Schubert, C.E., Bova, R.G., and Misut, P.E., 2004, Hydrogeologic framework of the North Fork and surrounding areas, Long Island, New York: U.S. Geological Survey Water-Resources Investigations Report 2002–4284, 23 p., https://pubs.er.usgs.gov/publication/wri024284. 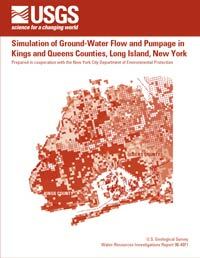 Misut, P.E., Monti, Jack, Jr., 1999, Simulation of ground-water flow and pumpage in Kings and Queens Counties, Long Island, New York: U.S. Geological Survey Water-Resources Investigations Report 1998–4071, 50 p., https://pubs.er.usgs.gov/publication/wri984071. 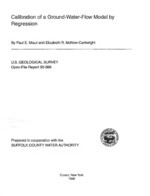 Delineation of areas contributing recharge to wells in central Long Island, New York, by particle tracking; 1996; OFR; 95-703; Misut, P. E.; Feldman, S. M.
Misut, P.E. ; McNew-Cartwright, E. R.
Calibration of a ground-water-flow model by regression; 1996; OFR; 95-388; Misut, P. E.; McNew-Cartwright, E. R.